Serving Tray for Centennial Beer from The Christ. Diehl Brewing Company out of Defiance, Ohio showing a large bottle sitting atop a mountain with a beautiful woman lifting her arms up to the bottle. 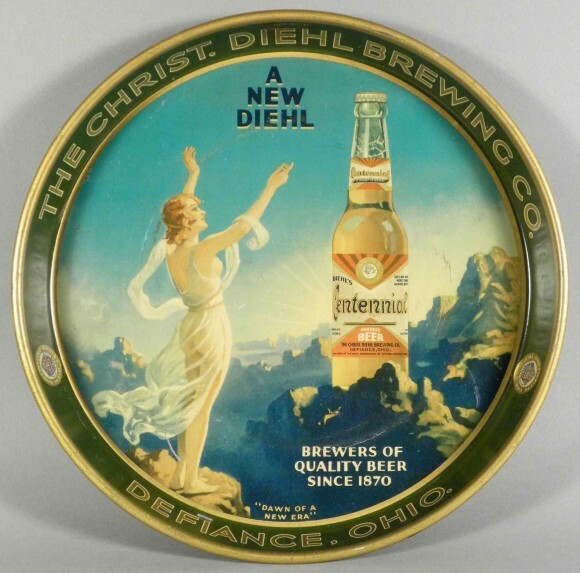 Text on the tray states “A New Diehl”, “Brewers of Quality Beer Since 1870”, and “Dawn of a New Era.” I am aware of another version of this tray which is nearly identical except that it does not have the “A New Diehl” located at 12 o’clock on the face of the tray. These trays date to the 1930s and is a 12″ round manufactured by the American Can Co of New York.